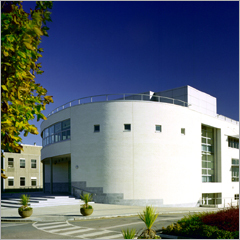 Luke Wadding Library on the Cork Road Campus is the Institute's main library and is one of the largest and most innovative third-level libraries in Ireland. Covering 6,000 sq. metres, with a range of resources and services and in excess of 1,000 reader spaces, the library is well-equipped to support the diverse learning needs of staff and students at the Institute. The building includes a dedicated learning centre, Special Collections room, staff reading area, and group study area. It is also home to the Academic Skills Centre, the eLearning Support Unit, and a Careers Advice centre. The library collection comprises over 180,000 print items, and over 120,000 eBook titles. In addition, the library houses over 340 hardcopy journals, and provides access to thousands of online journals through our database collections. There are over 150 student workstations available in the building with full Internet access and the library is a wireless zone. Luke Wadding Library is an energy efficient 'green' building and has won important architectural and Department of the Environment sustainable building awards. The building underpins Waterford Institute of Technology's commitment to being a regional centre of excellence and a world-class learning environment. The Walton Building is located on the Institute’s main Cork Road campus close to the award-winning Institute library, Luke Wadding Library. 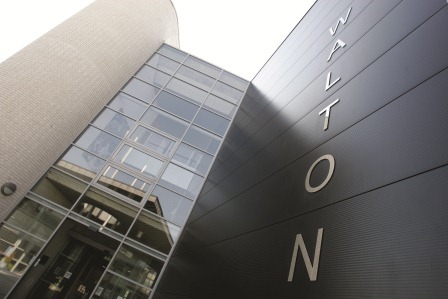 Named after Ernest TS Walton (the Co Waterford-born Nobel Physics Laureate) the 3,000 square metre Walton Building greatly enhances and expands the Institute’s world-class information and communications infrastructure. The 18 large computer laboratories in the building each feature an innovative passive air movement system that helps ensure comfortable learning conditions for users. A daylight-filled central atrium located alongside the entrance accommodates all circulation and social spaces. 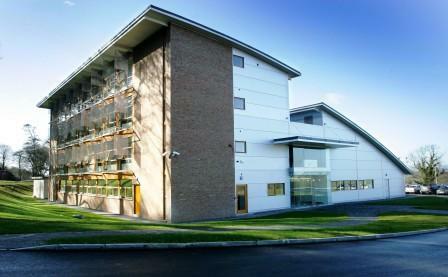 The O'Connell Bianconi Building is a 3,910 square metre building which accommodates the Institute’s Department of Nursing courses in general, psychiatric and intellectual disabilities nursing. A Centre for Nursing Studies was first established within the Institute in 1996 to coordinate the development of nursing programmes delivered in partnership with the South Eastern Health Board. The building is sited at the city end of the Cork Road campus near the striking Luke Wadding Library and Walton buildings and features an abundance of natural light and is designed on three levels around a central atrium space. Balconies accommodate circulation at each level while the use of corridors is avoided to help create a non-institutional atmosphere. Staff and student lounge areas overlook the main atrium space and provide views towards the rest of the campus. The Tourism & Leisure Building occupies a landmark site at the West end of the campus and provides an architectural counterpoint to the landmark Walton Building, the Luke Wadding Library and the Health Sciences Building at the city end. The building makes effective use of solar shading, natural ventilation and daylight and automatic light controls to minimise energy use and light and heat loss. In addition, energy efficient equipment is used throughout while the building’s concrete thermal mass helping to naturally cool it. The combination of these and other innovations removes the need for energy intensive air conditioning and provides a considerably better working environment for students and staff. The ArcLabs Research & Innovation Centre is located just 10 minutes from Waterford Institute of Technology's main campus, in a magnificent woodland setting beside the River Suir. 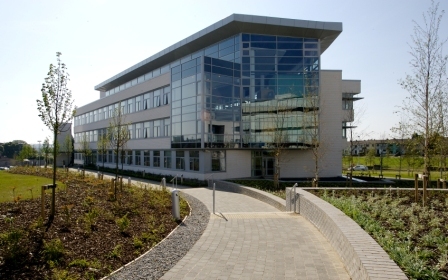 The building accommodates the Telecommunications Software & Systems Group (TSSG), one of the largest information and communications technology research groups in Ireland, together with the Institute's Centre for Entrepreneurship and the South East Enterprise Platform Programme (SEEPP) The goal of the ArcLabs Research & Innovation Centre is to provide entrepreneurs and early-stage ventures with the support needed to achieve success in national and international markets. The workspaces, the technical infrastructure and the atmosphere of innovation and co-operation make this a great place to do business. This new centre at the West Campus in Carriganore plays a vital role in the further development of the south east as a key ICT (information and communications technology) hub. 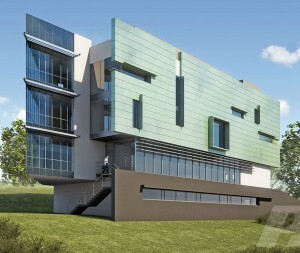 It is specifically designed in anticipation of an extended research future for the Institute. It is linked to the current ArcLabs facility which houses our unique Telecommunication and Software Systems Group (TSSG). This research group is the largest of its kind in Europe. It employs 140 people and has been instrumental in developing patents and establishing spin out companies.